Size of this JPG preview of this PDF file: 593 × 599 pixels. Other resolution: 237 × 240 pixels. 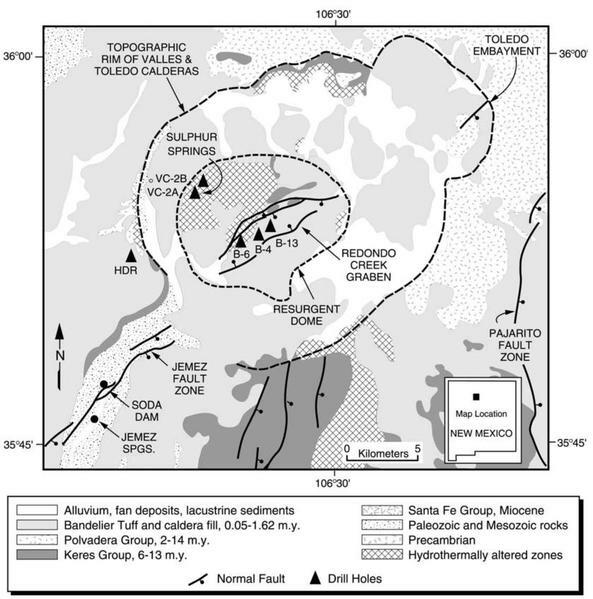 Map showing the locations of the Redondo, Sulphur Springs, and Jemez Springs geothermal areas and of the Fenton Hill HDR Project of the Valles Caldera. Modified from Goff and Janik (2002) Figure 2. ↑ Fraser E. Goff,Cathy J. Janik. 2002. 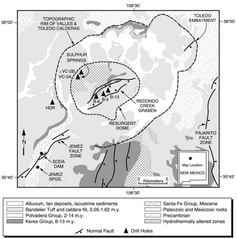 Gas Geochemistry Of The Valles Caldera Region, New Mexico And Comparisons With Gases At Yellowstone, Long Valley And Other Geothermal Systems. Journal of Volcanology and Geothermal Research. 116(3-4):299-323. This page was last modified on 16 May 2014, at 10:02.